Now close your eyes and picture it. You are a little child and you are afraid. Your Father is saying to you give me your right hand and He holds it tightly and He looks you right in the eye and says Fear not, I will help you! This is not the father who may have let you down or hurt you in the past. No this is your Heavenly Father who loves you with such love that you cannot even comprehend with your natural mind. This is the Father that is Greater than all earthly fathers whose mercy is new every day. He loves you with an everlasting love and He is jealous over you and wants you to know Him more and spend time with Him more each day. Hear His words “For I, the Lord your God, will hold your right hand, Saying to you, ‘Fear not, I will help you.’” He will help you through that job loss, the loss of your loved one, the loss of your home, your car, even your health. He will hold your right hand through it all and He says to you today “fear not”. Do you see it? Do you feel it? Do you know it? It is TRUTH! Don’t let the things of this world sway you away from this truth today. Look up with your child eyes and see your Abba Father as He takes hold of your right hand and walks you through every storm of life and reassures you “Fear Not”. He will help you. He has already been helping you and he will not let go of your hand. Praise be to The Lord God Almighty for He is our help. He is our strength, He is our provider. He is our Abba Father. If Jesus Christ is your Lord and Savior then you can be assured of this fact today. I haven’t made New Year’s Resolutions for a while now but each year I usually feel impressed by the Holy Spirit to focus on one area where He is dealing with me and it usually boils down to one word. That one word typically becomes the theme for my year. Well on Christmas Eve I happened to choose a Reading Plan on my Bible.com app called “One Word That Will Change Your Life”. It was a 4 day devotional plan that helps you simplify your life by choosing one word to focus on for the year. Interestingly I had not been trying to figure out my 2015 word yet so I thought this devotional was timely. I finished the plan and chose a word but I wasn’t sure about my choice so I just tucked it in my heart. This morning I was challenged to re-think my choice. I’m pretty sure that my new word choice is Holy Spirit ordained and makes much more sense to me than my first choice. Let me step back for a moment and share what has led me to my one word choice. When I wrote about not wanting to be depressed for the holidays I was truly in a good place in my life and had absolutely no reason to think that I would succumb to depression in just a short period of time. Just a short time after posting that blog I got one bad report, then another and then another and suddenly the familiar stench of the miry pit had encapsulated me once again. It was not just one set of circumstances, it was a myriad of problems that all popped up within a very short time span. Isn’t that the way it always happens? Most of us can handle a problem without losing it or falling into a depression but when we are caught in a seeming ambush of problems from all directions it further complicates matters. In just a moment of weakness and vulnerability I found myself in the miry pit just a few days before Christmas. All of my good sense obviously went out the window because instead of reaching out to my prayer partners to ask for prayer I turned away from everyone and shut myself off from the world like I used to do. My reasoning was that I needed to shut myself away so I could be alone with God as I knew He was putting His finger on something in my life. That something was fear. Fear was all up in my face and I didn’t want to trouble any of my sisters in Christ because it was Christmas you know. How could I intrude on anyone’s joy with my issues? Oh that’s the lie of the enemy right there because it only takes 10 seconds to reach out to someone for prayer. I know I would never have a problem with someone coming to me for prayer so why do I think my friends would not do the same? But you see when the miry pit overtakes you it’s hard to see past the darkness. It’s time I change my perspective of this verse from just knowing that God is with me and that He tells me not to be afraid. He says “Have I not commanded you? Be strong and of good courage”. This is not a suggestion, it’s a command. As I look over 2014, I’ve counted 5 times that fear has overtaken me and caused me to go back into the miry clay. Each time it has been a shorter time span and I see the gap has been closing. I’m declaring right now that it is time to put this fear problem behind me. I’m asking God to give me revelation to show me what courage looks like and how to walk in it. There is too much going on in this world for me to be held back by fear and it is time to get this settled. Lord Jesus, I am surrendering to You once again. I’m asking that You reveal to me what courage looks like and how to walk in it. I know that You are my source and I trust that as I keep my focus on You that I will continue to move beyond the miry clay. Lord Jesus, I ask that You speak to each reader of this blog and bless them to be able to surrender whatever issue or area of their life that You want to heal in 2015. What will your one word be for 2015? 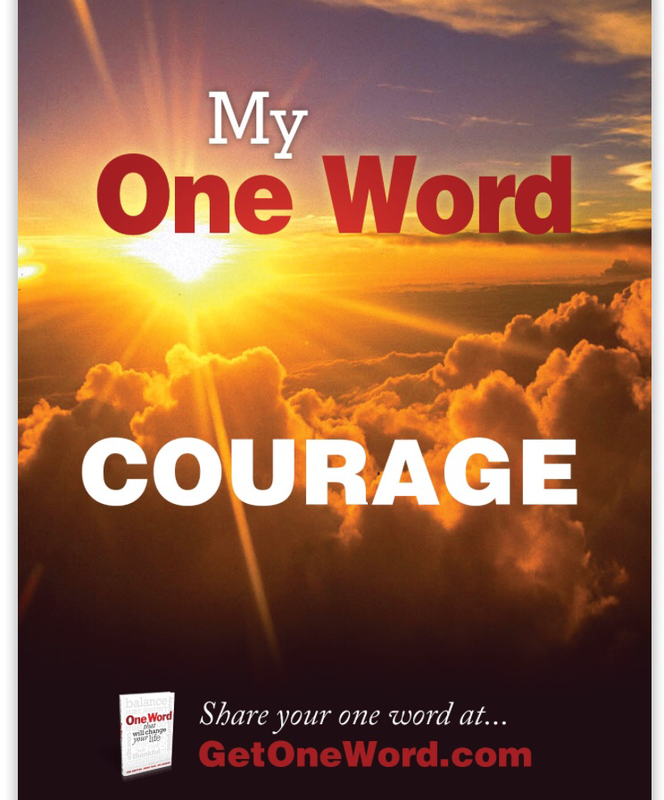 Please check out the GetOneWord.com for resources to help you discover your one word. Most importantly ask Jesus for the word He wants you to focus on. Feel free to share with me in the comments when you get your word. Thank you for following my journey. Happy New Year!! God bless you all!! 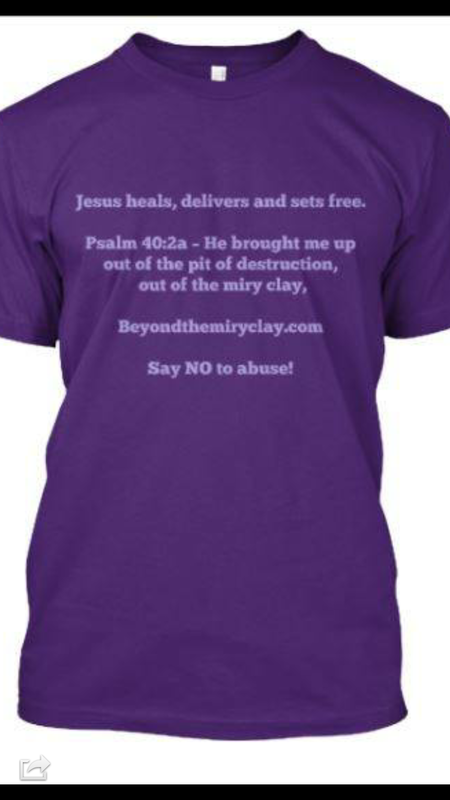 Please reserve your t-shirt or hoodie today, your purchase will support a local domestic violence shelter in Illinois. Thank you and God Bless!! Reserve your t-shirt or hoodie today!